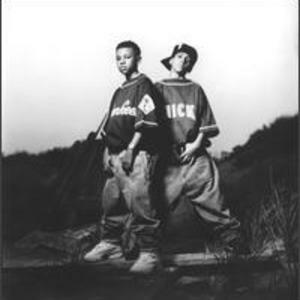 Kris Kross was a hip hop duo which formed in 1990 in Atlanta, Georgia, United States. The group consisted of Chris "Mack Daddy" Kelly (born May 1, 1978) and Chris "Daddy Mack" Smith (born January 10, 1979). The duo is best known for their single "Jump", which reached #1 on the Billboard Hot 100 in 1992. The group had three further Top 20 hit singles in the United States - "Warm it Up", "Alright" and "Tonite's tha Night" - before disbanding in 1996. They were found in 1991 performing at Lenox Mall in Atlanta, Georgia, by Jermaine Dupri. The duo's album, Totally Krossed Out, was released in 1992 and sold more than four million copies. It included the hit single "Jump", which stayed at number one on the Billboard charts for eight weeks. This landed them a spot on Michael Jackson's European tour that year as well as a cameo appearance in Michael Jackson's "Jam" video. It became a short-lived fad for youth to wear their pants backwards. 1992, at the peak of their popularity, a video game was released starring the pair entitled Kris Kross: Make My Video. It was released on the Sega CD system, and consisted of the player editing together the groups music videos to a few of their hit songs using portions of the original music videos, stock footage, and general video animation effects. Players were prompted before each edit session to make sure to have certain footage compiled into the video. The game was released in the US only to very lackluster sales figures and dismal reviews. It was ranked 18th on Electronic Gaming Monthly's list of the 20 Worst Games of All Time. Released in 1993, a second album, entitled Da Bomb failed to match their early success. 1996 saw the release of their final album Young, Rich & Dangerous which was also a commercial disappointment. By the end they stopped wearing their clothes backwards. A curiosity of Kris Kross' career was a television commercial they starred in to advertise the soft drink Sprite in 1992?93. After the group's demise, Kelly and Smith began writing and producing albums. Featured in the Jermaine Dupri Top 25 Countdown on BET. Ranked as #25. As of 2007, the group has reunited, currently working on different projects and still working for Jermaine Dupri. Chris Smith is releasing his new album, Urbane Expressions sometime in 2008, the first single from his album is titled "Lady." Chris Kelly has his own label called C.co records.